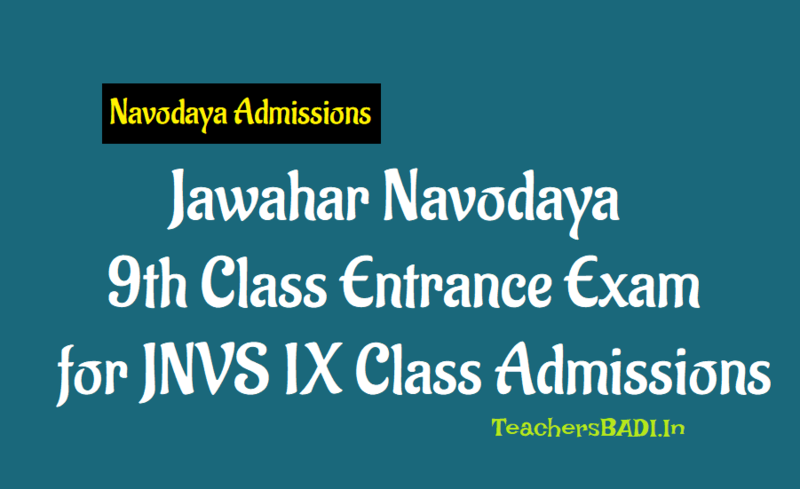 JNVS Navodaya 9th Class Entrance Test 2019: #Navodaya IX Class #Entrance Test 2019, NVS #9thClass Entrance Test 2019, Navodaya Vidyalaya Samiti Entrance Test 2019 for 9th Class, JNVS 9th class Admissions 2019-19, JNVS Selection Test 2019-20, navodaya Application Form, Navodaya Admit Cards, Eligibility Criteria, Navodaya Results, Navodaya Exam Date, Last date and more details given here...JNVS Selection Test 2019-20/Navodaya 9th Class Lateral Entry Test 2019 for admission into JNVs during the Academic Year 2019-2020: NVS Hyderabad region has issued Navodaya Vidyalaya Samiti Entrance Test 2019 Notification in the month of March, 2019. Jawahar Navodaya Vidyalaya Samiti Hyderabad Region invites applications from the eligible candidates for admission to Class IX of Jawahar Navodaya Vidyalayas of the District, against the vacant seats, which are likely to be available during the academic year 2019-2020. The admission is through an All India Test to be conducted on 02nd February, 2019 at 10.00 hrs. in Jawahar Navodaya Vidyalaya of the district concerned. The medium of test is English/Hindi. Result of the Selection Test will be notified in the Vidyalaya Notice Board as well as published in selected local newspapers. Selected candidates will also be intimated by post. As envisaged in National Policy of Education (NEP), 1986, Govt. of India set co-educational residential institutions named Jawahar Navodaya Vidyalayas in 28 States and 07 UTs excluding Tamil Nadu. At present, 595 Vidyalayas are functional in the country. The main objective of these Vidyalayas is to provide quality modern education to the children predominantly from rural areas. Though the admission into these Vidyalayas is at VI class, it is intended to fill vacant seats with a lateral entry test at IX Class level. Applications are invited for admission to Class IX of Jawahar Navodaya Vidyalayas of the District, against the vacant seats, which are likely to be available during the academic year 2019-20. The admission is through an All India Test to be conducted on Sunday, 02-02-2019 at 10.00 hrs. in Jawahar Navodaya Vidyalaya of the district concerned. The medium of test is English/Hindi. 1. Only those candidates who have studied in class VIII during the Academic Session 2018-18 in one of the Govt./Govt. recognized schools of the district where the Jawahar Navodaya Vidyalaya is functioning and where admission is sought. 2. Candidate appearing for the selection test must pass Class VIII in the academic session 2018-19 from a Govt./Govt. recognized school in the district where he/she is seeking admission. 3. Candidates seeking admission must not have been born before 01.05.2003 and after 30.04.2007. This will apply to candidates of all categories including those belonging to SC/ST. 4. Navodaya Vidyalaya Samiti reserves the right to refer any candidate to a MEDICAL BOARD for confirmation of the age of the candidate in case a doubt arises about the age certificate produced by the candidate before the admission is given. The test will be objective/descriptive type with 03 hours duration without any break. Centre for the examination will be Jawahar Navodaya Vidyalaya of the concerned district. Admit Card for appearing at the Selection Test will be issued to the candidates by ..... If the candidate does not get the Admission Card latest by ....., he/she must contact the office of the Principal of Jawahar Navodaya Vidyalaya for obtaining the same. Result of the Selection Test will be notified in the Vidyalaya Notice Board as well as published in the website of JNVs concerned. Selected candidates will also be intimated by post. 2. Issue of Admit Cards from: 22-01-2019.
very important information is given in this article. thanks .we are thankful to you. keep the updates on this site. plz update jnv entrance exam results in official jnv website.v can see selected candites ... it is vry difficult to come and see in school notice board plz this is student request ..
jnvs ke 9th ke online admission form kab ayege. jnvs ke 9th ki entrance exam ki date kab hai.